Originally brewed back in 2007, Dogfish Head's Red & White is a Witbier with a decidedly Dogfish twist. While most Wits are easy drinking summer-favorites, this is a big 10% ABV monster. My last encounter with big Witbiers, Samuel Adams Imperial White, left me scratching my head a little, I'm ready to give the concept another shot. Red & White takes a "wine meets beer" approach, and is fermented with Pinot Noir juice. Once fermentation is complete, one fraction is aged in Oregon Pinot Noir barrels, while another is aged on oak staves. The two oaked portions are then blended back into the bulk and the beer is ready for bottling. 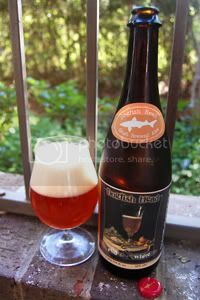 Dogfish describe the resulting product as "successfully marry[ing] a Belgian-style white beer with the robust complexity of a bold red wine." Color me intrigued. Let's get to it. Appearance: A slightly hazy, pumpkin-colored body with plenty of sediment in solution. Up top, two fingers of creamy, off-white head that endures well and leaves decent lacing. Aroma: Spices (mostly coriander), orange peel, and some booze (not nearly as much as you'd expect given the double-digit alcohol rating). Unfortunately, it's all just a little on the thin side. Taste: The same orange peel and spice notes with some new grapey notes added into the mix. All of this is over a sweet, slightly wheat-like malt backbone. With the barrel-aging promised on the label, I was hoping to pick up some good oak notes, but I'm just not finding it. Perhaps that's because this is a sweeter beer. As for the alcohol, it's much more present in the mouth than in the nose and adds a lot of complexity without being too overpowering. The aftertaste is boozy and grapey. Mouthfeel: Nicely thick and sticky with moderate carbonation. The alcohol dries it all out in the end and leaves some definite burn. Drinkability: Very close to sipper territory, especially given the alcohol content. Verdict: On paper, Red & White is a brilliant idea and would seem to yield something imminently unique and exotic; however, it's just not that special in the glass. This would work well as a beer to share with friends during dessert, just don't be expecting the most complex beer on the planet.